Hort. Kew. [W. Aiton] 1: 414 1789. Origin and Habitat: Cyrtanthus obliquus grows on dry, rocky, sloping ground on sandstone-derived soils in open grassland and under thickets or low bushes where there is good drainage. It is found in the coastal grassland from KwaZulu-Natal through the Transkei to Humansdorp in the Eastern Cape. Habitat and ecology: Typically it grows in rock outcrops in thicket vegetation, often in fairly dry areas well off the beaten track. The thick, grey leaves enable it to survive in the hot, dry conditions it is found in. 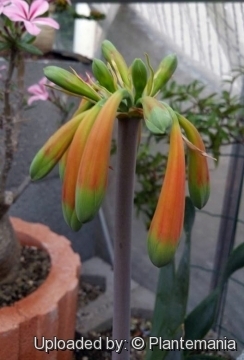 In its native habitat, Cyrtanthus obliquus is visited by sunbirds, and both the striking colour combination of orange and green and the stiff waxy hanging tubular flowers are adaptations to bird pollination. Description: Cyrtanthus obliquus is a very attractive evergreen species, with its large pendulous flowers and grey-green twisted leaves, dying down for a short time in winter while it is dormant. The flowers are very waxy in texture, in vivid colors, around 7 cm long. The flowers looks somewhat like Clivia nobilis, and both species happen to be pollinated by the same sunbirds in the wild. It was introduced into cultivation by the Kew plant-collector Francis Masson in 1774, but has never become as common as its beauty would seem to merit. Derivation of specific name: The specific epithet, obliquus means slanting or sideways and possibly refers to the way the leaves emerge from the bulb. Bulb: Ovoid, large and fleshy, like an onion, 7-10 cm across. Tunics brown, membranous. 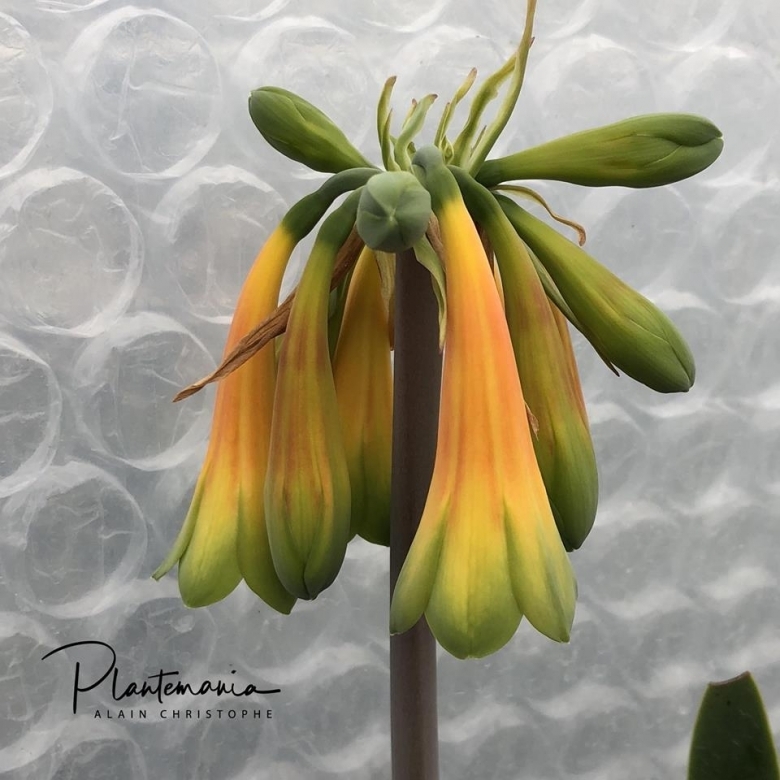 Leaves: 10-12, produced after the flowers, distichous, flat, leathery, lorate, 40-60 sm long, 2.5-5 cm wide, but quite variable from area to area from sharp-pointed and strap-like with slight twists, to blunt, short and very twisted, glaucous, with a smooth reddish margin. The hotter and drier the locality, the shorter and more twisted the leaves become. Inflorescence: Peduncle upright, round, slightly compressed, mottled, 30-60 cm long, 12-20 mm in diameter. Umbel with 6–12 flowers, very drooping. Pedicels 12-25 mm long recurvedly reflexed, intermixed with membranous bracts shorter than the corolla. Spathe-valves 4, lanceolate, reflexing. Flowers: Flowers are funnel form tubular somewhat fleshy and firm and also vary considerably. They are, inodorous, tubular with expanded calyx lobes and are 7 cm long, with 6-12 flowers on a pedicel. The common colours Perianth curved, 5-8 cm long, varying from shades of red to orange with various amounts of green on the lip of the umbel. The rarer colours are from yellow to bronze. Tube twice as long as the segments, dilated gradually to a throat 8-12 mm in diameter. Segments oblong, much imbricated, 20-25 mm long, 8-12 mm broad. Stamens biseriate, inserted low down in the perianth-tube. Filaments 20-25 mm long for about half way fused to the tube. Anthers small, oval oblong perpendicular, reaching about half-way up the segments. Ovary green, oblong, 6 mm in diameter. Style reaching to the tip of the segments. Stigma subpubescent, capitate. Fruits: Capsule oblong-triquetrous, 25 mm long. 3) Du Plessis, N. & Duncan, G. "Bulbous plants of southern Africa". Tafelberg, Cape Town. 1989. 4) Hutchings, A., Scott, A.H., Lewis, G. & Cunningham, A. "Zulu medicinal plants." University of Natal Press, Scottsville, Pietermaritzburg.1993. 5) Jackson, W.P.U. "Origins and meanings of names of South African plant genera." University of Cape Town Ecolab.1987. 6) Leistner, O.A. (ed.). "Seed plants of southern Africa: families and genera". Strelitzia 10. National Botanical Institute, Pretoria. 2000. 7) Pooley, E. "A field guide to wild flowers of KwaZulu-Natal and the Eastern Region". Natal Flora Publications Trust, Durban. 1998. 8) Zimmer, G.F. "A popular dictionary of botanical names and terms". Routlage & Keegan Paul, London.1912. Cultivation and Propagation: Cyrtanthus obliquus is relatively difficult to cultivate successfully over an extended period. It is usually evergreen in cultivation but needs to be kept with much less water in winter and blooms in spring and summer. Its winter rest must be absolute. Water sparingly when growing and a little care, it is a definite water-wise species. It prefers a full sun position with at least two-thirds of the large bulb exposed above ground. Coarse river sand or gravel must be incorporated into the growing medium for excellent drainage. Traditional uses. The bulb of Cyrtanthus obliquus is used to relieve a chronic cough and dry bulb layers are used as snuff and to relieve headaches resulting from head wounds. In the Xhosa and Zulu (Amathunga) language it means to sew or knit (as in knit in bones). It is used medicinally for broken bones, cuts and abrasions. It is often used in conjunction with other herbs.